Press TV – Nearly 40 people have lost their lives and dozens of others sustained injuries when a powerful bomb explosion struck near several buses carrying people from two Shia-majority villages in Syria’s northwestern province of Idlib, as they were waiting to enter the city of Aleppo. State-owned Arabic daily Tishreen said the explosion took place as children were collecting food being distributed at the stop point. 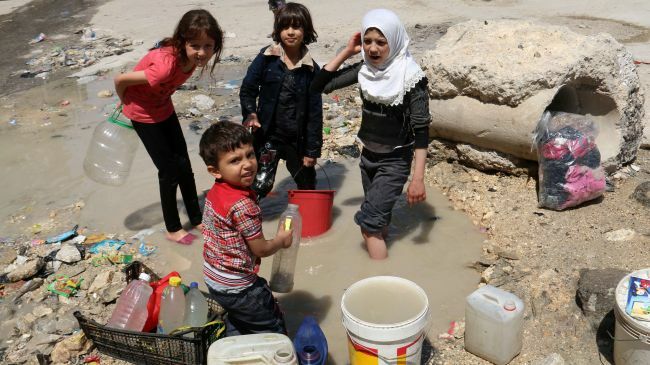 In late March, the Syrian government and militant groups struck a deal that envisaged the transfer of 16,000 people from Foua and Kefraya in exchange for the evacuation of militants and their families from al-Zabadani and Madaya towns in the southwestern province of Rif Dimashq. Meanwhile, Ibrahim Mousawi, a political analyst from Beirut, told PressTV that the blast was a stark example of the Takfiri terrorist groups’ “treason” with respect to their agreements with the Damascus government. “Here you are talking about a responsible government that has the integrity, the honesty in order to carry out with its agreements, while when you talk about the different opposition groups … they are responsible, they should be held responsible for the atrocity, for the disaster, for this massacre that happened to the people who were evacuated from Kefraya and al-Foua,” he said. “This tells you very much that these Takfiri groups, they never honor their own agreements,” the analyst added. He further noted it is the responsibility of the countries sponsoring the Takfiri groups –namely Turkey, Qatar and Saudi Arabia – to cut off their support for these terrorists. He also criticized the international community and organizations for turning a blind eye to what is happening in Syria, stressing they are hypocrites with regard to the events in the crisis-hit Arab country. The explosion on Aleppo’s outskirts came shortly after a bomb explosion targeted a military camp in Syria’s western coastal province of Latakia, leaving nearly a dozen people dead and several others injured. Local sources, speaking on condition of anonymity, said a car rigged with explosives was detonated by remote control in Salma village, which lies northeast of the provincial capital city of Latakia. No militant group or individual has claimed responsibility for the attack yet, but such assaults bear the hallmarks of those carried out by the Daesh Takfiri terrorists. Meanwhile, nearly 30 civilians, mostly women and children, have been injured after Daesh Takfiri terrorists carried out separate attacks against two residential neighborhoods in Syria’s eastern city of Dayr al-Zawr. Local correspondent for Syria’s official news agency, SANA, reported that at least 29 people had been injured after the extremists lobbed a barrage of missiles and dropped bombs on al-Qosour and al-Joura districts. The attacks caused material damage to residential buildings and private properties in the targeted areas. Assistant Director of Health Department in Dayr al-Zawr, Dr. Akram al-Jouri, said three of the injured were in critical conditions. The three have reportedly undergone surgery. Jouri added that the rest of the injured were receiving medical treatment at al-Assad and the Military hospitals in the city.